My target is to make an Arduino system that is able to change modes with different delays by pushing a button. For example, if I pressed the button, it will go into mode 1 with loop 1 that has a 30s delay. If I pressed it one more time, it will go to mode 2 with with loop 2 that has a 1 min delay, etc. The important thing is that mode 1 should be breaked when the push button pressed. The code below solved part of the problem. However, LEDs are only constant ON, they are not blinking for a certain time then it turned either on-off within the mode when the push button pressed. S1 is responsible to activate D12 to be constant ON (when it’s pressed once) which lead UNO2 to be powered then blink the right LED ON (1min) OFF(4Hr), (pressing it twice should turn D12 OFF (optional)). The same thing with S2, when it’s pressed once it should first disable D12 and activate D11 instead, powering UNO3, blinking the left LED ON(30S), OFF (4Hr). In addition, blinking on() off() repeatedly is needed (unless action break/occur, ex: pressing S1 or S2). About S1 and S2. The LED on D12 will flash ON for 1 minute then turn off for 4 hours. After the 4 hours, the LED on D12 will flash ON again for 1 min then turn off for 4 hours again & again...as an infinite loop. With S2 The LED on D11 will flash ON for 30 seconds then turn off for 4 hours. After the 4 hours, the LED On D11 will flash ON again for 30 s then turn off for 4 hours again and again as an infinite loop. In response to your comment on Matej's answer @Ibrahim.M: "I wish I can abbreviate it with only one UNO that able to do the same task by using programming.". You can do this with just one Uno. I would start by detecting the button presses and debouncing them. This is easy to do using the Bounce2 library. You can use the button presses to start timers which will turn the LEDs On and Off. To make an LED flash on and off, and to keep time, you can use the millis() function. I started with the BlinkWithoutDelay tutorial, and came up with the following sketch. 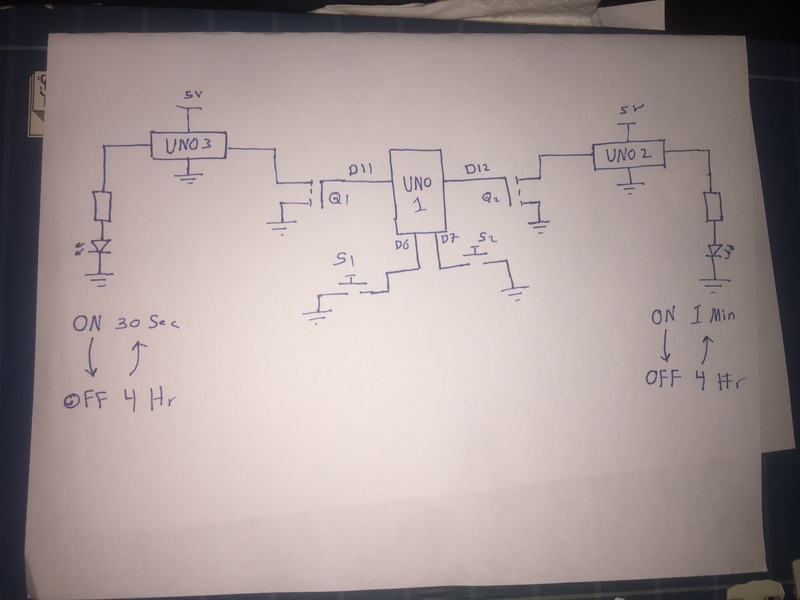 It only has one timer / LED flasher, but there is enough information in the sketch to figure out how to make the second timer / LED flasher. // 4 hour, 30 second timer. // 60 sec X 60 min X 4 hours + 30 seconds. Based on this part of your last comment "I’ve a trick! ‘const unsigned long oneSecond = 1000;’ should be edited to ‘const unsigned long oneSecond = 10;’ this make the led be as a constant ON. ", it sounds like you want the LED to remain ON constantly for the 30 or 60 seconds. I have "commented out" 5 lines of the above sketch that will make this happen. Read it and try it.